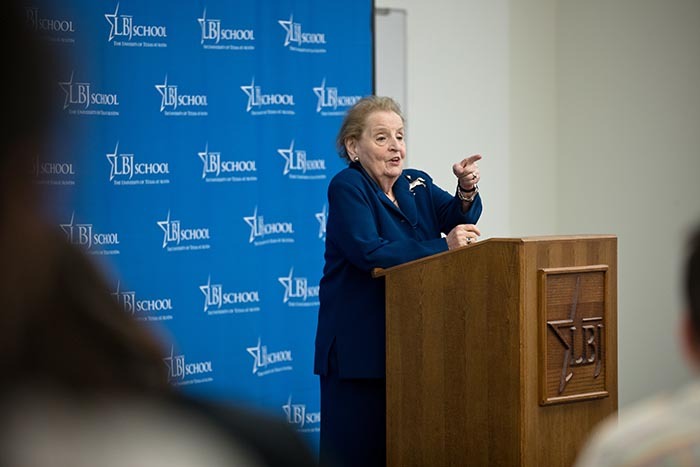 On Friday, Oct. 27, former U.S. Secretary of State Madeleine Albright, the first woman to hold that office, joined the LBJ School for an exclusive visit with students. Secretary Albright talked about foreign policy and her career as secretary of state from 1997 to 2001 under President Bill Clinton. She offered insight in response to student questions about the U.S.'s role in the world, discussing the country's relationships with Russia, Latin America and North Korea, foreign policy tactics versus strategy and international relations under the Trump administration. Secretary Albright also spoke about being a female leader and role model, and about the importance of public service. Incredibly excited to share the same air as @madeleine at the @TheLBJSchool - Loving the fact we have filled this room with women! "I have spent my life looking at the rise of Russia," Albright said when asked about Russia in the world today. "Everyone must understand the history of Russia to know what is going on," she said, adding that she finds the rise of an opposition movement in Russia quite interesting. When Albright left the State Department, most Latin American countries had moved toward democracy, but since, economic issues have pushed some of them back to being semi-authoritarian states. Additionally, public opinion of the U.S. has been colored by leaders as they blame the U.S. for many problems. "I think our relationship with Latin America is damned if you do, damned if you don't," she said. Albright said the U.S. is at a disadvantage due to a lack of presence in North Korea. "When we don't have an embassy in a country, it puts us at a disadvantage," Albright said, explaining that embassies give a country eyes and ears on the ground. When asked about the difference between strategy and tactics in foreign policy, Albright said, "What I think is happening now is the strategy is being figured out through the tactics." However, she said, there is danger in that. "People do not recognize that incremental steps take you down a road with possible unintended consequences," she explained. "That is why it is important to have an overall strategy." She explained that foreign policy requires complete coordination between force and diplomacy, and figuring out that balance is part of the magic of policy. Albright also discussed how the current administration is using diplomacy to shape foreign policy. "People [around the world] look at whether America is living up to its values," she said. "Americans are questioning what our role is generally." Albright explained the dynamic and often complicated relationship between the two roles. "They compete for the president's heart ... The national security adviser is just a few feet away from the president. … The secretary of state is a few blocks away or on an airplane." "It never occurred to me in life that I was going to be a role model," Albright began. She said she wanted to be a journalist and recounted a time when an editor told her she would not work at a newspaper. Albright pursued her Ph.D. instead and became involved in politics. Earning the Ph.D. was useful, she said, because "Dr. Albright" carried weight at a time when she had to establish herself among a group of men. Despite her qualifications, however, her mentor told her he didn't think a woman could work in congressional relations. "There was a lot of question as to whether women could do any of the jobs," she said. "Women need to interrupt. … If you raise your hand, they won't call on you." She continued to say that there should be more women at the table, stressing the importance of supporting each other. "We [women] are very judgmental about each other," Albright said. "Women project their own weaknesses onto other women. Men do not do that to each other." "I really do think that your generation is coming of age in a different era and there is genuine desire to be involved," Albright said. "We need your generation to be reminding everyone what America is all about." She said students must study and learn how to work with people from across disciplines—religion, language, science, technology—in order to be in public life. "I went to college sometime between the invention of the iPad and the creation of fire," she joked. 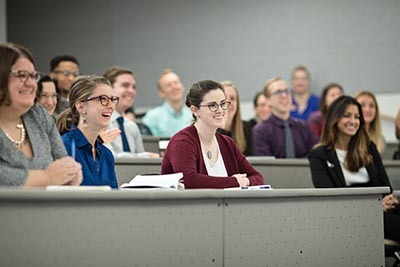 She said she learned the importance of taking courses beyond her immediate interests and encouraged students to do the same to stretch their minds. "You are a remarkable generation that needs to be involved more than ever," she said. "There are serious issues in this country. Tuning out is a mistake. When people of your generation decide they cannot do anything, we’re really in very deep trouble."